Product Manager in Heels: Marketing or Management? The Product Manager's Dilemma! Marketing or Management? The Product Manager's Dilemma! Product Marketing is something that has been on my mind recently. 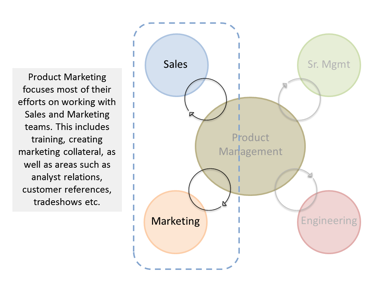 The separation of product marketing and product management has been hard to identify, particularly because product managers sometimes do product marketing, and product marketers sometimes do product management. I’ve written about this before, and I think it’s important to explore this topic again! - Product Management is the intersection between business, technology and UX (user experience), product management focuses on identifying the business value from/for a product, working with technology to build that product and working with UX to ensure the users voice is heard. Here are a few additional articles; I’d be very interested in your feedback on this topic! Sorry for the delay in posting – it’s been crazy trying to wrap up the semester, get ready for a launch of a new product at work, and working on my new business. I’m looking forward to getting back into the swing of things this spring/summer! The way I often partition product management and product marketing is that the product manager is responsible for defining the value proposition and the product marketer is responsible to turning that value proposition into communications to the market. I do not usually consider the product marketer to be responsible for "bringing requirements based on market needs to product management" - I think that's still part of product management's purview. I have nothing against getting ideas from product marketing or anyone else (a lot come from sales and pre-sales, for example, in addition to coming directly from customers, not to mention the developers in a lot of cases). But it's product management's responsibility to figure out how to transform those ideas into requirements, and to understand how to prioritize the requirements once they are created. Nils - you bring up a great point about designing the product offering. I think the jobs certainly vary across different organizations. That's for the advice! All the activities that you list under Product Marketing here are done by Product Management in my team. We use the marketing team to design some lead generation email templates and anything that concerns branding. I always did think that when I studied it in B-school, segmentation, targeting and positioning came under marketing. However, the real world seems to be different. Aneesha, that's so interesting! Do you have a product marketing team? I think it's a really delicate balance. You'll read a lot in Pragmatic Marketing that there is often so much overlap. I'd be interested to hear more about this in your organization. I have posted on my blog about this a few times. I am of the belief that until your business gets to a pretty good scale, you really can only afford to have one "product" person, and that person needs to be part inbound requirements gathering/validation/requirements documenting, and part outbound marketing. In many companies I have been at with $50 - $100M in revenue, the role is pretty much one person, and yes, you have to compromise on skills, as rock stars who can do both are rarer than hen's teeth. Above that revenue level, and I see the marketing role becoming a separate person, and then you can make sure you best optimize the skills in the individual. It should be noted that even in smallish companies, there should be a separate "marketing/communications" person and role. They should work closely with product marketing, and sadly, I see a lot of product marketers who dismiss the traditional marketing communications role. Thanks for the insight! Always refreshing to hear that other PM's struggle with this as well.